This very hungry caterpillar ate ten, 10 frames! Since my kiddos love Eric Carle's story, The Very Hungry Caterpillar, I decided to make this quick, easy, and fun "print & go" game, which reinforces numbers 1-10, number words, groups/sets, and addition. Before starting the game, children number the body segments. To reinforce number words, have them write the number above the 10 frame and the number word underneath. 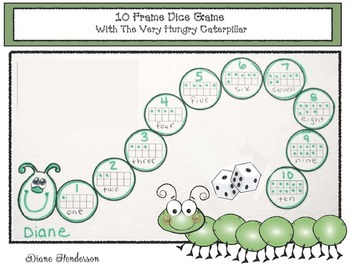 If a child rolls an 11 or 12 they get to draw facial features on their caterpillar's head. The first one who completes their caterpillar is the winner. I'm Diane from Teach With Me, hoping your kiddos enjoy this game as much as mine do.